Energic motoculteurs where ideally suited and adapted for work in viticulture. They could be modified in width to deal with the demand specific to this type of agriculture, as well as slopes, depths and spraying. 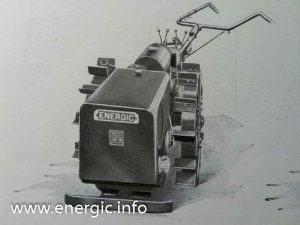 The first Energic motoculteurs used in vine work where the B1 (later the B5), then the C7 B4L, D9 5BL and latterly in late 1933 the S bloc C7 and D9’s. Here we have a working photo of a Energic motoculteur C7 B4L adapted for vine work with “Bavolet protecteurs”, wheel protectors to prevent damage to the vines as the moteurculteur passes. “. This Energic motoculteur C7 B4L is towing a single plow followed by a harrow system that required an extra person to guide the equipment (direction, depth).The air filter is positioned above the engine cover, normally protected in the engine cover, due to the dusty nature of the work.The wheel weight where positioned inside the wheels, to reduce the width. There is a extra bar for steering (see below adjustable steering option on later models). 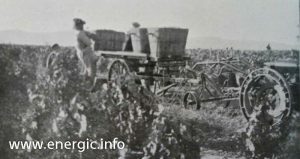 Unusual photo of vine work in the early 1930’s. 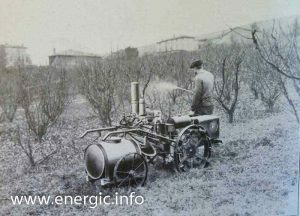 Energic motoculteur C7 B4L operating direct chain drive for spraying lances. (This is a photo of a system used both in orchards and vine work – here in orchards with out the wheel protectors). 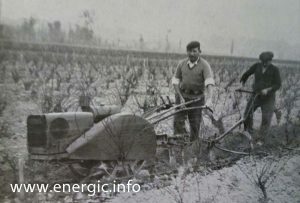 Collecting the harvest using your Energic motoculteur as a moteur for pulling carts.